Stadio Ennio Tardini was built in the 1920s at the initiative of club president Ennio Tardini, who however died before the stadium was completed. It was consequently decided to name the stadium in his honour. Stadio Ennio Tardini officially opened on the 16th of September 1923. Back then it was a small oval-shaped stadium that had a running track circling the pitch. The stadium got gradually expanded in the following decades, however remained a modest stadium. It was only when Parma became more successful in the late 1980s that the stadium was properly developed. Between 1990 and 1993, three of the four stands were completely renovated, starting with the Petitot Stand in 1990, and followed by the North and South Curves in 1992 and 1993. The running track got built over, resulting in the stadium’s current rectangular shape. 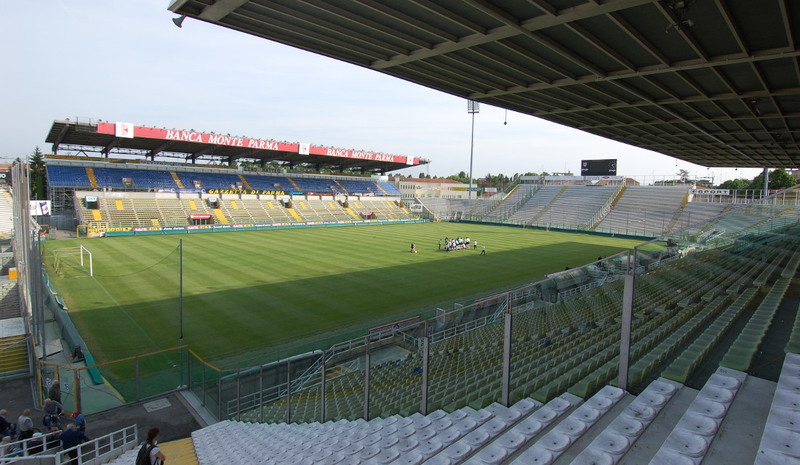 Stadio Ennio Tardini is located on the south-eastern edge of Parma’s city centre. The walk from the central Piazza Garibaldi takes about 15 minutes, while the walk from Parma’s main railway station, located towards the north of the centre, takes about half an hour. Alternatively, the stadium can be reached by bus. Take bus 9 (in the direction of Via Zoni) from Parma’s main rail station. Bus 9 goes at least twice an hour and passes though Parma’s city centre. The ride takes only 10 minutes, get off at stop Stadio Tardini. Bus 8 and 21 also stop in the close vicinity of the stadium. Stadio Ennio Tardini lies a short walk away from Parma’s pleasant and interesting historic centre, which boasts a good selection of bars and restaurants. Similarly, any hotel in Parma’s city centre will be at walking distance from the stadium. Click here for an overview of hotels near Stadio Ennio Tardini and Parma’s historic centre. Ticket for Parma games can be bought online via Listicket, at the ticket windows of Stadio Ennio Tardini from one day before the match, or at any of the Listicket sales outlets in Parma and surroundings, which includes Tabaccheria Paterlini at the Via Garibaldi 27 in central Parma. Tickets can also be bought on the gate on the day of the match. Parma very rarely sell out. Tickets for the Curva Nord cost €15.00, whereas tickets for the long sides range in price from €20.00 to €55.00. Prices can be increased for a few high-profile matches. Parmacalcio1913.com – Official website of Parma Calcio 1913. Parma.it – Website of the Parma tourist office. Tep.pr.it – Public transport information for the city of Parma.